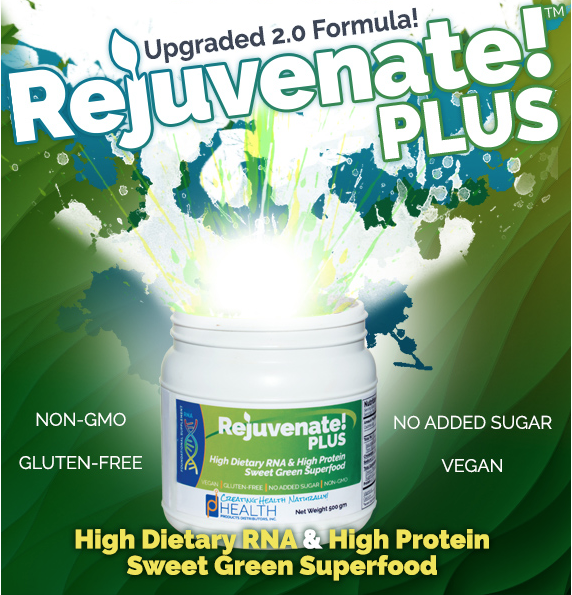 Rejuvenate!™ superfoods are the world’s first superfoods formulated specifically to provide therapeutic levels of dietary nucleic acids (RNA, DNA, nucleosides, and nucleotides). 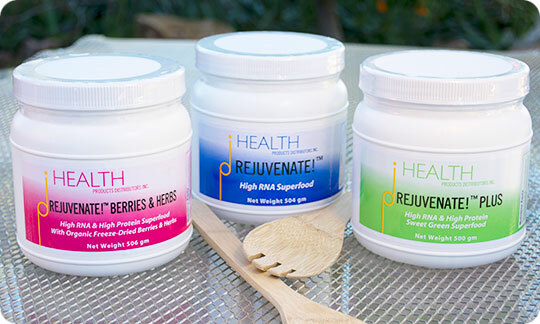 HPDI currently offers three versions: Rejuvenate! Original, Rejuvenate! PLUS, and Rejuvenate! Berries & Herbs. All three Rejuvenate! formulas provide at least 340 mg of dietary nucleic acids per serving. The pioneer nucleic acid researcher, Dr. Benjamin S. Frank studied the beneficial effects of nucleic acids on humans and animals during the 1960s and 70s. Dr. Frank concluded that dietary nucleic acids are essential nutrients for health. He advised consuming a range of 300–1,500 mg daily. 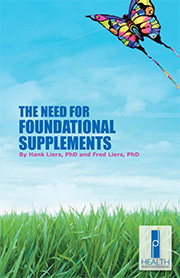 However, he noted that healthy benefits are apparent at levels as low as 75 mg.
Hank Liers, PhD formulated the Rejuvenate! line of superfoods to leverage the powers of dietary nucleic acids for health. These superfood powders are nutrient dense, tasty, easy to consume, portable, and powerfully healthful. While all Rejuvenate formulas contain dietary nucleic acids from a variety of sources, Rejuvenate! Original and Rejuvenate! PLUS contain chlorella, known to contain the highest levels of nucleic acids among all foods. Chlorella also provides many benefits beyond nucleic acids. In this article, I will explore chlorella as an important ingredient in Rejuvenate! superfoods, as well as a superfood in its own right. Chlorella provides more dietary nucleic acids than any other green superfood ingredient. Chlorella is a single-celled, fresh-water aquatic plant, named so after the Greek word chloros meaning “green”— because it contains large amounts of the green phytonutrient chlorophyll. Millions of people take chlorella every day (many in East Asia) because it is a highly nutritious superfood. Researchers who’ve studied chlorella extensively say it’s nature’s “perfect food.” In fact, NASA studied it as a food for astronauts. Chlorella provides a broad spectrum of nutrients, including protein, essential fats, fiber, chlorphyll, vitamins, and minerals, including trace minerals. Chlorella also provides the highest levels of dietary nucleic acids among all foods. Dietary nucleic acids (e.g., RNA) are now recognized as powerful, natural substances that provide supernutrition, rejuvenate, heal, and help create optimal health. 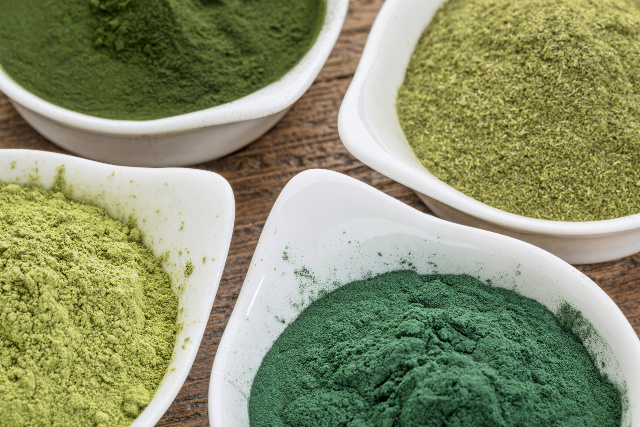 Chlorella can help you look and feel younger. Studies confirm what people taking chlorella have long experienced—the anti-aging effects of dietary nucleic acids on skin, eyes, hair, hands, and other visible parts of the body. Skin typically becomes smoother, tighter, and clearer. Deep lines, wrinkles, and “crow’s feet” are often reduced. Even acne and foot calluses can clear up as skin becomes softer and healthier. Hair color may return and its texture may become richer and thicker. These changes are more than skin deep. 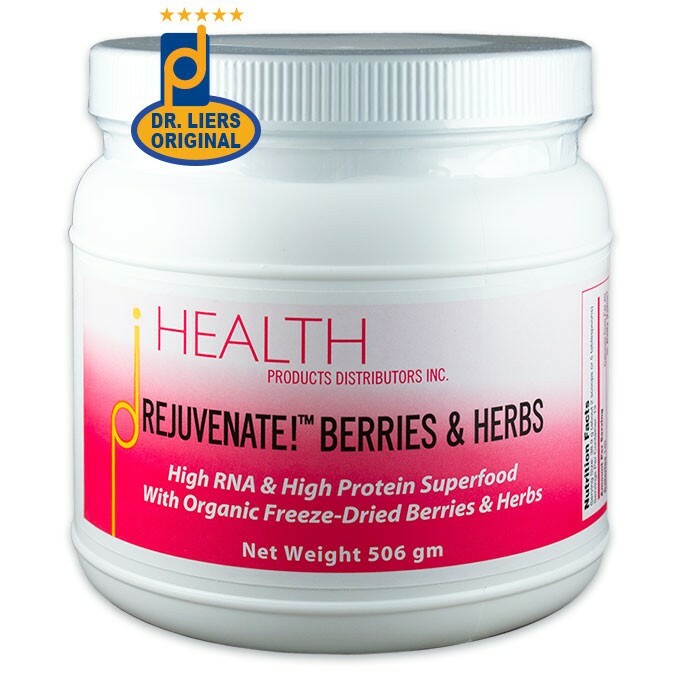 They reflect inner changes created by the nutritional powers of dietary nucleic acids for optimal health. According to pioneer nucleic-acid researcher Dr. Benjamin S. Frank in Dr. Frank’s No-Aging Diet: Eat and Grow Younger (34), individuals can look and feel five, ten, or even fifteen years younger. That is the little-known power of dietary nucleic acids for health. Dr. Frank saw those results with his patients consuming dietary nucleic acids (from fish and yeast sources). The anti-aging effects were so evident, he wrote: “It shows on your face.” He saw it happen with nearly all his patients. Dr. Frank emphasizes that such changes in appearance aren’t just “skin-deep” and in fact aren’t even “cosmetic” at all (from a medical standpoint), but stem from deep-down improvements in health (6). After years of experience with thousands of patients, Dr. Frank concluded that dietary nucleic acids could “revolutionize the appearance of most Americans, because most…are in poor health…aging faster than necessary” (Dr. Frank’s No-Aging Diet, 34). Dr. Frank cared about his patients and knew dietary nucleic acids could help them be healthier. What Dr. Frank did not know about was chlorella, which is at least 10 times higher in dietary nucleic acids than nutritional yeast or seafoods. If he had known about chlorella, he would have advocated for its consumption to realize the benefits of its dietary nucleic acid content. Because chlorella is a rich source of nucleic acids, you can expect the type of results reported by Dr. Frank regarding his patients. The benefits of chlorella add up over time—helping people looking and feeling younger—far longer than experienced by those consuming typical (SAD) diets. In my own experience, I saw myself “growing younger” after consuming chlorella for about three weeks. My rejuvenation hasn’t stopped—I look and feel youthful for my age, and it’s nice having plenty of energy. I’m compelled to share my knowledge about chlorella so other people can benefit from its dietary nucleic acids and other healthy nutrients. There is a powerful connection between our inner health and outer appearance. When we meet our body’s needs for nutrition and for the energy to carry out its tasks, we can experience glowing health. The dietary nucleic acids in chlorella can help everyone look and feel their very best. • Heart Health. Chlorella’s nucleic acids help rejuvenate your entire body, including your heart. Chlorella also contains essential fatty acids (i.e., “good” fats), including omega-3 (alpha-linolenic acid). These fatty acids combine with chlorella’s proven ability to lower cholesterol, as well as the rejuvenating and energizing effects of nucleic acids to support excellent cardiovascular health. In addition, the strengthening and anti-inflammatory actions of polysaccharides, and chlorella’s ability to remove toxic heavy metals play significant roles in reducing the stiffness ness of vessel walls, thereby improving their resiliency and elasticity. • Breathe Easier. Nucleic acids vastly improve cellular oxygenation and oxygen utilization in the body—enabling far more efficient use of oxygen, including the ability to function better with less. This is a truly remarkable benefit to anyone who wants improved breathing capacity, living in polluted environments or at high altitudes, and for aerobic exercise of any kind. Studies show nucleic acids dramatically boost exercise performance via increased breathing capacity, greater stamina, and ability to perform physical tasks faster and longer. • Mental Sharpness. 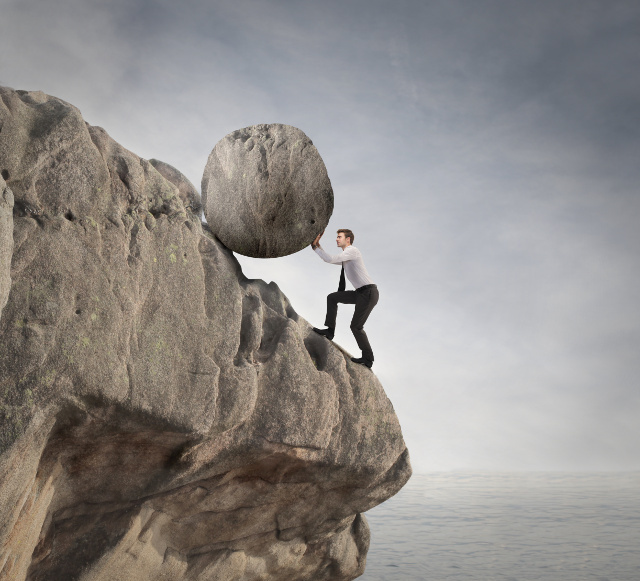 The nucleic acids in chlorella greatly improve oxygen utilization, which can greatly improves your mental performance. The capacity of chlorella’s cell wall to help the body eliminate toxic metals (lead, mercury, arsenic, cadmium) also plays a role in increasing mental acuity. • Blood Sugar Stabilization. Chlorella helps stabilize blood sugar levels by supporting and balancing the liver and pancreas. When these organs do their jobs effectively, blood sugar levels naturally become better balanced. In addition, chlorella can reduce cravings for carbohydrates and sweets. • Liver Support. Chlorella rejuvenates and cleanses the liver (and other detoxification organs). Nucleic acids directly stimulate cellular repair in liver tissue while improved elimination functions reduce cholesterol and fats in the bloodstream. This helps the liver be more efficient and keep the body healthier. 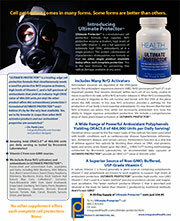 • Intestinal Health. Supports growth of healthy intestinal flora (“friendly” bacteria) in the digestive tract, aids bowel elimination, and deodorizes. •Alkalinizing Effects. Chlorella brings balance to body pH by creating alkaline conditions — counteracting the effects of acid-forming foods and substances. This helps create greater health. • Feel Great. Chlorella’s benefits act synergistically. When all body systems repair and heal, they work better together. Health is more than the absence of disease. 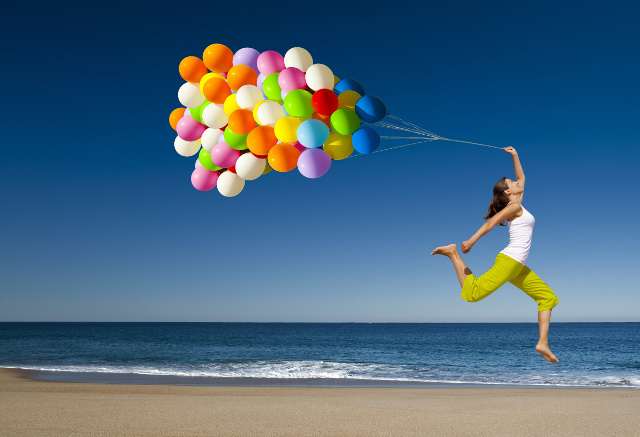 When all parts function optimally — in a natural, healthy way — the result is often feeling great due to good health. Nature has blessed us with chlorella, a superfood with countless health benefits. That is why we include chlorella in Rejuvenate!™ superfoods. 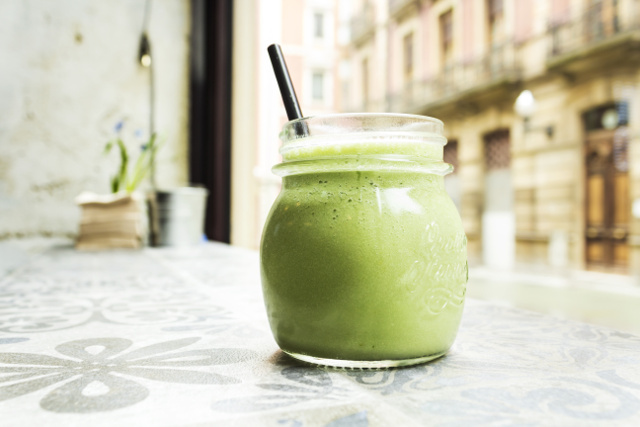 Consuming a daily green superfood drink with chlorella is a healthy habit. The ancient Greek philosopher Hippocrates famously exhorted, “Let food be your medicine.” Yet individuals and society don’t always embrace this truth. Low levels of nutrition offered by the so-called “Standard American Diet” (SAD) are implicated in the rise of degenerative diseases and other conditions of poor health. Ironically, our age is a time of great food abundance and great malnutrition. A time when food quantity often exceeds food quality. Facing significant declines of nutritional values in modern foods (due to processing, refining, toxic additives, soil degradation, agricultural chemicals, etc. ), as well as the nutrient-depletion in our bodies related to factors like high-speed/high stress lifestyles, poor food choices, and lack of education about nutrition, why should a nutritious superfood like chlorella go overlooked? Times are changing. People increasingly want nutrition facts about healing foods and super nutrition offered by whole foods like chlorella. CHLORELLA – NATURE’S PERFECT FOOD? Nucleic Acids, including RNA, DNA, and nucleic acid derivatives — a sort of “fountain of youth” providing energy for your cells. Chlorella Growth Factor (GGF) — health-building nucleotide-peptide complex that boosts immunity and speeds healing. Richest Source of Chlorophyll of any plant, 4%–7% or greater. 10 times more chlorophyll than alfalfa. Chlorophyll is an amazing healing phytonutrient that powerfully heals, purifies, cleanses, and detoxifies. High-Quality Plant Protein (62% or more) — vegetable protein that’s easy to digest and assimilate. Antioxidants, Enzymes, and Phytonutrients, including naturally occurring beta-carotene and lutein. Vitamins, including vitamins A, C, D, E, and K1; all major B vitamins, and vitamin B12. Minerals and Trace Elements, including iron, calcium, potassium, phosphorus, magnesium, iodine, zinc, manganese, and others. 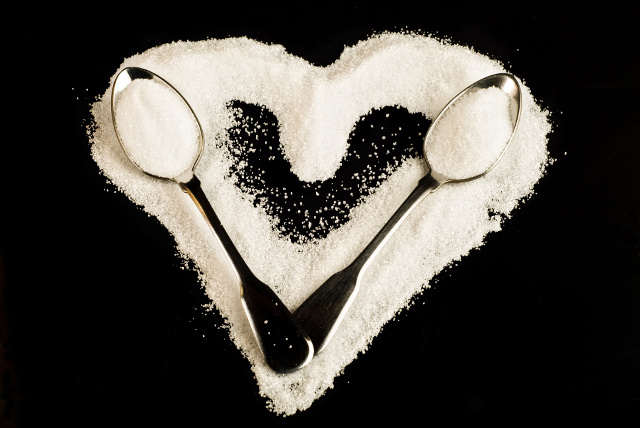 Polysaccharides — protecting your vascular system, strengthening connective tissues, and building immunity (by stimulating interferon production). 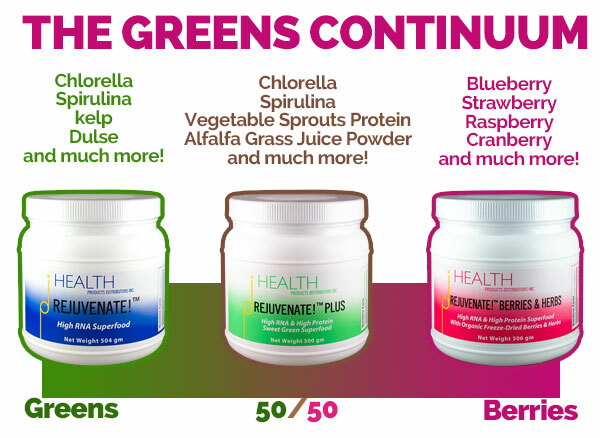 These are some of the nutrients chlorella provides. Let me tell you a little more about chlorella’s dietary nucleic acids because they are responsible for many of the benefits of chlorella. While chlorella contains many valuable nutrients, one group of nutrients stands out as exceptional: its high content of nucleic acids. In particular, RNA (ribonucleic acid) and DNA (deoxyribonucleic acid). Nucleic acids are involved in many bodily processes, especially energy production and communication within cells (i.e., they enable cells to use energy effectively for greater health). In the cell nucleus, RNA carries out instructions coded in DNA—instructions containing information critical for cell structure and function—which are essential for the lives of our cells. When our cells receive proper directions and energy to carry them out, they have the resources to help keep us youthful, or at least not age prematurely. Chlorella’s nucleic acids provide us basic materials for repairing and replacing our RNA and DNA, thereby giving us potentially greater energy, vitality, and longevity. Our bodies naturally make nucleic acids. However, with increasing age we gradually lose our capacity for synthesizing them. This is where nucleic acids from foods can make a difference for health. As noted, pioneer RNA researcher Dr. Benjamin S. Frank discovered that dietary nucleic acids not only improve health, but also slow down and even reverse the aging process. Many decades of research led Dr. Frank to conclude that nucleic acids are not only improve health, but they’re actually “essential nutrients.” In particular, he describes RNA as “the anti-aging factor.” His research laid the foundation for understanding the effects of all high-nucleic acid foods, including chlorella. In his books, Dr. Frank predicts nucleic acids will be the “medicine” of the future, but says that everyone can benefit right now — by eating high-nucleic acid foods. In fact, his best-seller Dr. Frank’s No-Aging Diet is a guide for helping people learn about consuming foods high in nucleic acids for optimal health. Yet, he’s hardly alone in his enthusiasm for nucleic acids from foods. Dr. Frank has plenty of company in his praise for dietary nucleic acids. In a classic, groundbreaking book titled Chlorella, Jewel of the Far East, natural healer Dr. Bernard Jensen focuses on the health benefits of chlorella and its nucleic acids. Dr. Jensen states, “Eating foods high in nucleic acids provide the material for the repair and production of human nucleic acids…the breakdown of DNA and RNA in the cells [is]…one of the main factors in aging and in degenerative diseases” (83). He spent his life traveling the world searching for secrets of health and longevity. He was impressed by the “mind blowing” effects of dietary nucleic acids on human health, especially the effects of chlorella. Dr. Jensen marveled at chlorella’s nutritional characteristics. He understood then that it would take time to study and understand the mechanisms behind chlorella’s evident benefits. However, he was clear in stating that while science takes time unraveling chlorella’s mysteries, anyone can benefit from consuming it right now—without waiting for the day when modern science fully reveals how it makes us healthier. He also states, “We know from studies, from experiments and the experiences of many people that chlorella protects the body and restores health, without undesirable side effects” (85). Nutrition science already reveals the foods highest in nucleic acids. These foods include fish, organ meats, beans, brewer’s yeast, and most of all chlorella. Yet, foods and superfoods aren’t typically promoted for their high nucleic acid levels. Most doctors and nutritionists know little about the importance of dietary nucleic acids. Yet, nothing prevents individuals from consuming high-nucleic acid foods right now, as Dr. Frank and Dr. Jensen advise. Nucleic acids are known to increase energy levels and cellular oxygenation, boost physical stamina and lung power, and augment overall health and well being. They also smooth skin, reduce wrinkles, increase lean muscle mass, lower cholesterol, support cardiovascular health, aid metabolism, stabilize blood sugar, and even help regulate body temperature (for example, they can increase body warmth for greater comfort in cold climates). One essential fact you need to know about chlorella’s nucleic acids is that they dramatically increase energy. Nucleic acids boost energy levels in the body by significantly increasing production of the “high-energy” molecule ATP (adenosine triphosphate), and thereby retard the aging process. Our bodies use ATP in many ways. For example, cell repair, healing, metabolism, digestion, supporting the immune system, and other processes. This means chlorella is a total body healing food and a systemic healer that rejuvenates deeply from the cellular level on up, and from the inside out. Our bodies know exactly how to use dietary nucleic acids to make energy to satisfy our needs. In this sense, RNA acts as a “smart” nutrient providing energy wherever we need it most, and thereby functions as an “adaptogen.” Precisely because dietary nucleic acids support metabolism and slow aging, many nutrition scientists consider chlorella among the top superfoods in the world. Chlorella offers more than an incredibly high nucleic acid content. The 5% nucleic-acid rich fraction of chlorella contains a substance known as “Chlorella Growth Factor” or CGF. First isolated by Japanese scientists in the mid-1950s, Chlorella Growth Factor is a nucleotide-peptide complex containing nucleic acids and nucleic-acid derivatives, like amino acids, peptides, nucleotides, nucleosides, polysaccharides, beta-glucans, and other beneficial substances. Most importantly, it’s natural, safe, and demonstrates potent healing powers. CGF is best known for having powerful growth stimulating properties. In fact, in Japan it’s used to boost growth in children with growth disorders. CGF doesn’t boost growth in adults, but instead enhances immune system response, repairs nerve tissues (e.g., especially helpful for brain and nerve disorders), and works powerfully to speed healing. Also, the body uses this growth factor to produce energy in support of metabolic processes and to revitalize cellular functioning. Because CGF is a concentrated source of nucleic acids (RNA and DNA), its constituents act synergistically to provide you with superb nutrition for optimal health. CGF offers potent health benefits like immune support, rapid healing, regeneration, and rejuvenation. Thus, Chlorella Growth Factor is another reason why chlorella is one of most complete superfoods on the planet. Chlorella’s energizing and healing powers are remarkable. Its nucleic acids and Chlorella Growth Factor support optimal health. Yet, chlorella also contains vast quantities of chlorophyll, the green phytonutrient found in all plants. As a superfood that gets its name from chlorophyll, chlorella’s chlorophyll content is extremely high—4% to 7%, or greater. That’s the highest chlorophyll content of any plant. Chlorophyll itself is a significant healing substance. Chlorophyll has many proven benefits: it cleanses, deodorizes, disinfects, detoxifies, alkalinizes your body, and speeds healing (internally and externally). It has been said, “If you’re green inside, you’re clean inside.” And due to chlorophyll’s structural similarity to human blood cells, consuming it builds a high blood count. Due to industrialization, polluted water, dental amalgams, and consumption of predatory fish (high in mercury), it is estimated that most Americans have relatively high levels of toxic metals in their bodies. Chlorophyll helps reduce the burden of metals on the body. • Removes pesticides, polychlorinated biphenyls (PCBs), dioxins, and industrial chemicals. • Builds a high blood count and thereby can improve anemia due to chlorophyll’s structural similarity to human blood cells. (See Dr. Bernard Jensen’s The Healing Power of Chlorophyll, 105). Chlorophyll is a powerful healer. People take everything from parsley extracts to wheatgrass juice to obtain its benefits. But chlorella contains far more chlorophyll than these sources and provides many other health-building elements–as discussed above—a winning combination for good health. Few foods offer as many benefits for health as chlorella. Providing dietary nucleic acids, Chlorella Growth Factor (CGF), chlorophyll, protein, vitamins, minerals, essential fats (omega-3 and omega-6), antioxidants, polysaccharides, phytonutrients, and fiber, chlorella is an ideal ingredient to include in superfood formulas. Thus, chlorella provides users with high levels dietary nucleic acids and many other healthful nutrients that work synergistically to support optimal health. 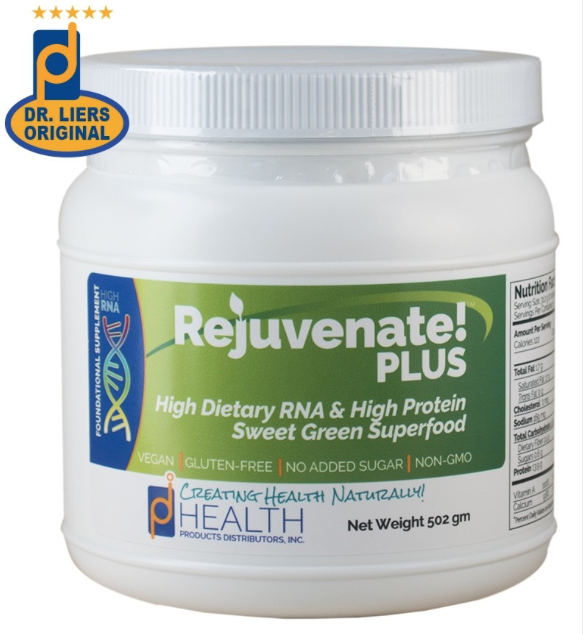 Hank Liers, PhD formulated Rejuvenate! superfoods specifically to provide high levels of dietary nucleic acids. Chlorella is one of several significant sources of the dietary nucleic acids in HPDI’s Rejuvenate! Original and Rejuvenate PLUS. Note: Rejuvenate! 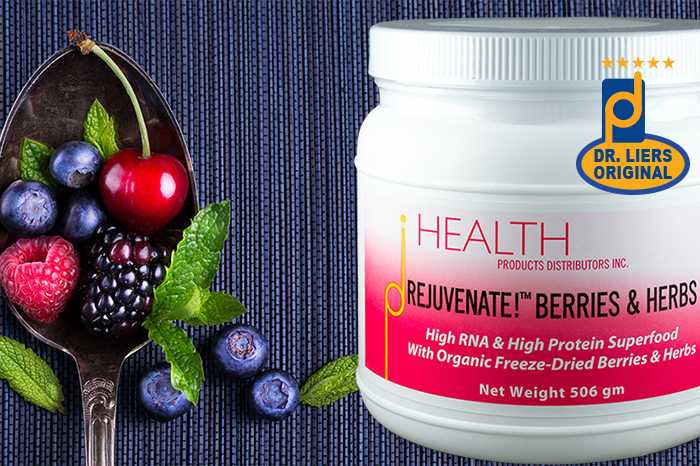 Berries & Herbs contains no chlorella (or any greens), but still provides therapeutic levels of nucleic acids. Chlorella is a champion ingredient among high-RNA ingredients. Individuals interested in optimal health should consider chlorella and superfoods high in chlorella as allies providing the highest levels of dietary nucleic acids and nutrients supporting their use in the body.